Back in December when I looked at Metacritic's list of albums set to be released this year, Arcade Fire was one of a few that got me excited enough to mark the release date on my Google Calendar. Approximately eight months after my nerdish act, I am quite elated with the resultant work. The album unfolds like a complicated story addressing the borderline insignificant life of retreating to the cookie-cutter confines of the suburbs, bookended in introduction and conclusion by the plunky piano title track. 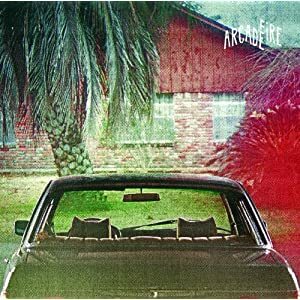 I was a big fan of Neon Bible, a moderate fan of Funeral, but generally find everything that Arcade Fire touches to be both interesting and enjoyable, and The Suburbs certainly fits that same description. Overall, like all good albums, this one needs to be appreciated and thus reviewed as a whole. Breaking down each track seems futile as each track plays off its predecessor and successor and all though independently good, seems to be missing pages without the surrounding songs. In pulling out individual tracks for those singles-minded listeners, "Rococo" tops my list of slightly off-kilter tracks that has a building, repetitively addictive chorus and an upbeat tone. "Ready To Start," "City With No Children" and "Suburban War" also stand out as capturing listens. All in all, at 16 tracks and an hour of playtime, this is an ambitious release that puts the band's genre-jumping range, thoughtful and poetic songwriting and exceptional talent on full display. I still can't decide if this is the band at their best, but as is now expected, this is the band operating at a level much better than most. I really like this album. It's definitely worthy of a Best New Music tag, but will it be able to crack my already packed top 10 albums list? Not sure.